Wow can you believe its been 5 weeks since we started this sew along. 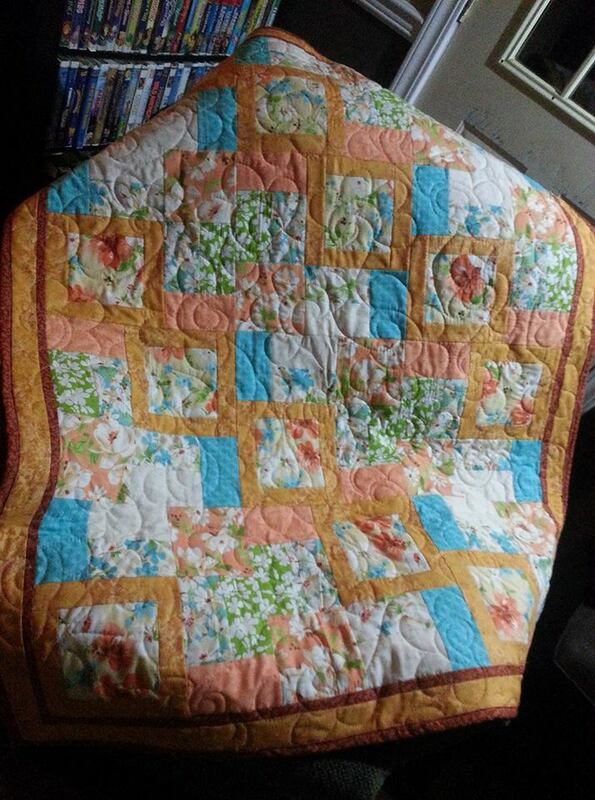 In that time I have been able to finish quilting the one that is being used for the pattern. Here’s what it looks like bound and quilted. I like to piece my back to reduce the amount of leftovers of materials used for the top so this is the pieced back. Before I go on to giving you the last part I want to let you know that I have joined my 2nd blog hop. This year Marian at Seams to be Sew is hosting Stories Of Christmas a Christmas Caroling Row Along. Keep your eyes peeled for this it should be fun as we have many blogs that are participating this year. I have chosen Winter Wonderland as my song. Ok lets get on to the reason most of you are visiting this blog… Here is the last part. Thank you for joining me in this project. Please if you make this share pictures with me you can email them to Chairo@telus.net or put them on my Facebook page found at https://www.facebook.com/ReneeChesterQuiltDesings2016/ . This is the one that I have been making with you. Here is a recap of all the part if you have missed some parts.